A new map of the western parts of Virginia, Pennsylvania, Maryland and North Carolina; comprehending the river Ohio, and all the rivers, which fall into it; part of the river Mississippi, the whole of the Illinois River, Lake Erie; part of the lakes Huron, Michigan &c. and all the country bordering on these lakes and rivers. Course of the river Mississipi from the Balise to Fort Chartres; taken on an expedition to the Illinois, in the latter end of the year 1765. The land of our birth. The following poem was then read by Prof. Rodney Welch one of the editors of The Times, of Chicago, a native of Monmouth, Kennebec county, Me. [Chicago? Ill.]. New Salem, home of Abraham Lincoln 1831 to 1837. 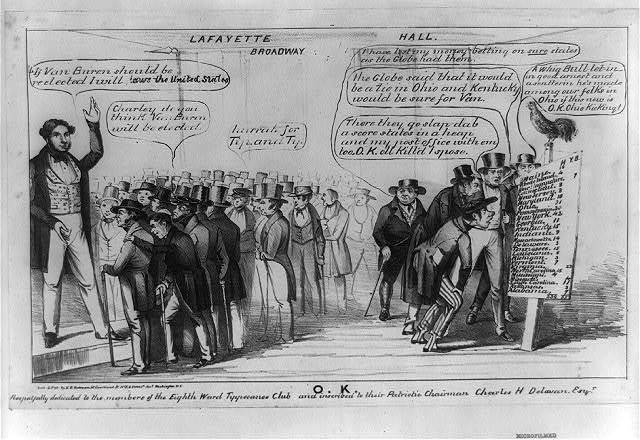 Drawing of the Alton education lottery for the promotion of education. 22nd of November A. D. 1838. [Alton 1838]. 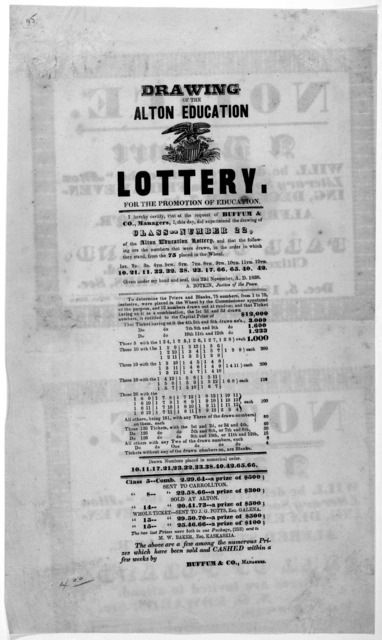 Drawing of the Illinois state lottery. Authorized by the Legislature to raise funds, for the purpose of draining the ponds and lakes in the American bottom, and of improving the health thereof. 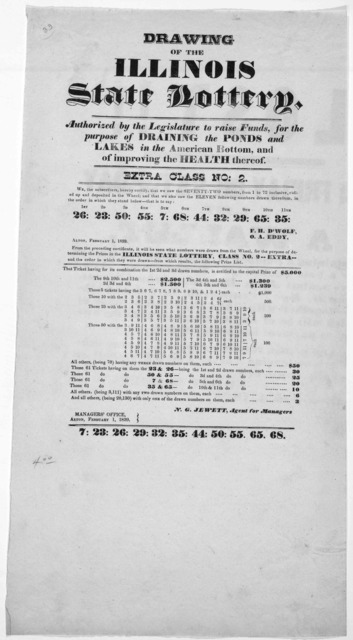 Extra class no: 2 ... Alton, February 1, 1839. Lost!! 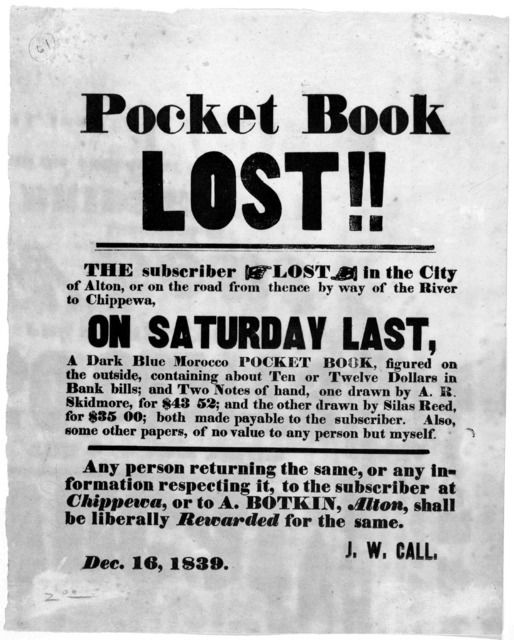 on Friday or Saturday last, a wallet, containing a number of papers; among which was a note against N. Buckmaster. Also notes against John Mullady, John Chivens, John B. Dyo, Wentworth, Sacket, and others ... Edwin M. Hopping. Alton, Feb.
Collector's notice. To the tax payers of Macoupin County ... B. T. Burke, Collector of Macoupin County. Carlinville, June, 1839. Order of procession of the Harrison convention at Carlinville, July 25th, 1840. 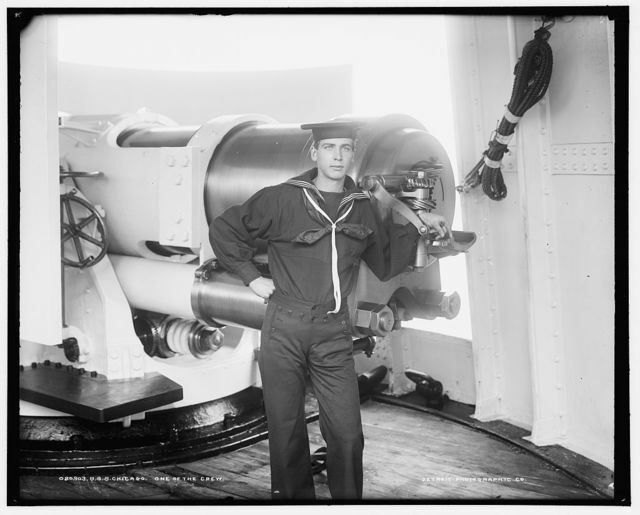 [Carlinville? Ill.]. To the voters of Greene and Jersey. E. M. Daley and his certificates! proved false. Fellow citizens ... Jacob Van Dike. 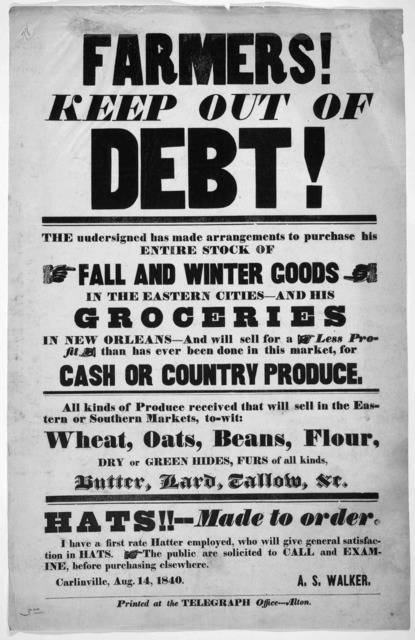 Jerseyville, August 1, 1840. To the voters of Madison County. The people of [blank] precinct, are respectfully solicited to meet the candidates at [blank] on the [blank] day of July, at 12 o'clock. [s. l., 1840?]. Second annual fair of the Greene County Agricultural society ... Carrollton, Greene Co. August 15, 1840. Alton. Printed at the "Telegraph" office . $100 reward! 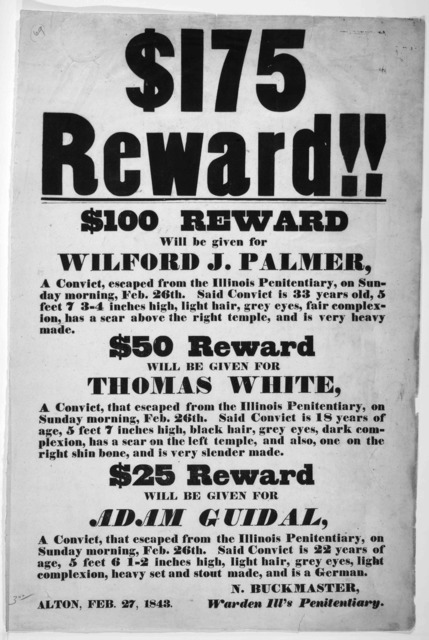 escaped from the Illinois penitentiary, on the night of Friday, August 7, 1840, a convict named Hansel G. Horn ... I. Greathouse, Warden Ill's penitentiary. 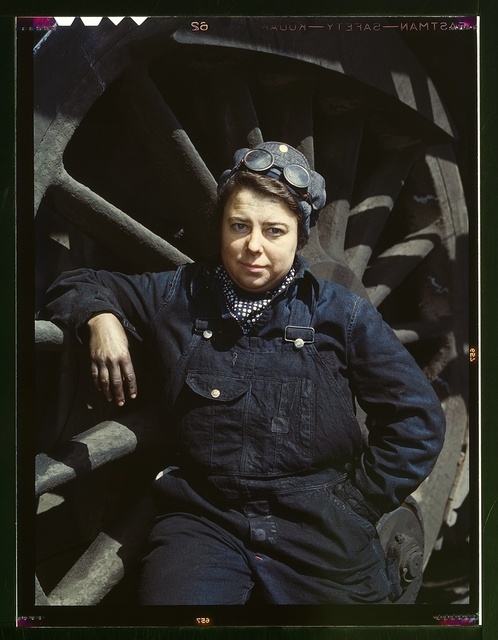 Alton, Aug. 8 &#x2018;40. 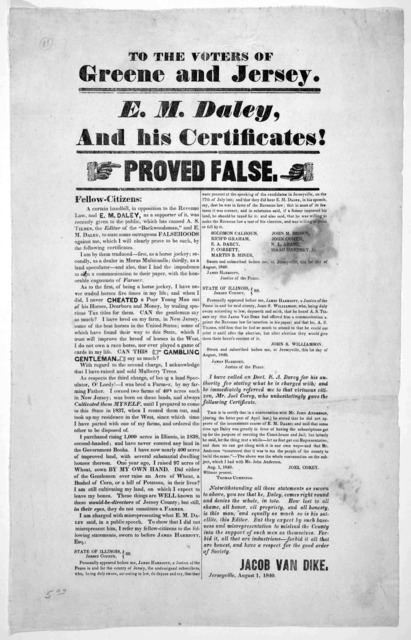 To the voters of Jersey County [Campaign broadside ticket for Jersey county] Jerseyville [Ill.] July 24, 1840. [Jerseyville? Ill.]. The philosopher's stone! Gold & silver plating, by the electro-magnetic apparatus ... Alton. 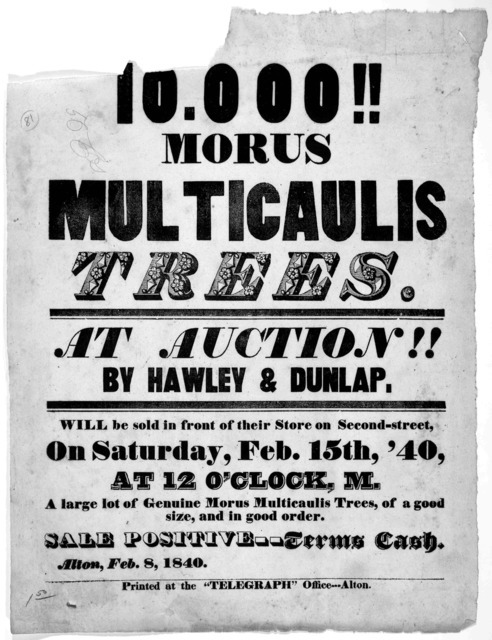 Printed at the Telegraph Office [1840?]. Notice!! 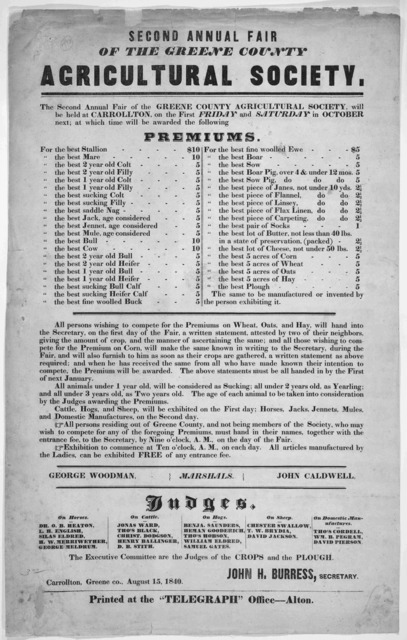 Taken from the subscriber, on the night of April 16th, at Nutter's tavern in Upper Alton, a calfskin pocket book ... William H. Hungerford. 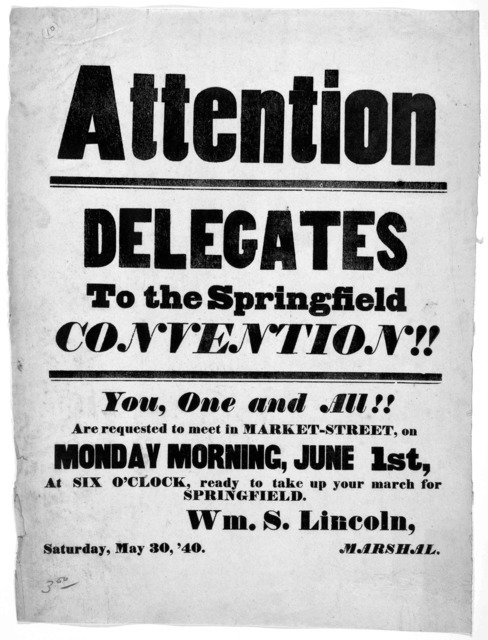 April 17, 1840. Alton. Printed at the "Telegraph" office . 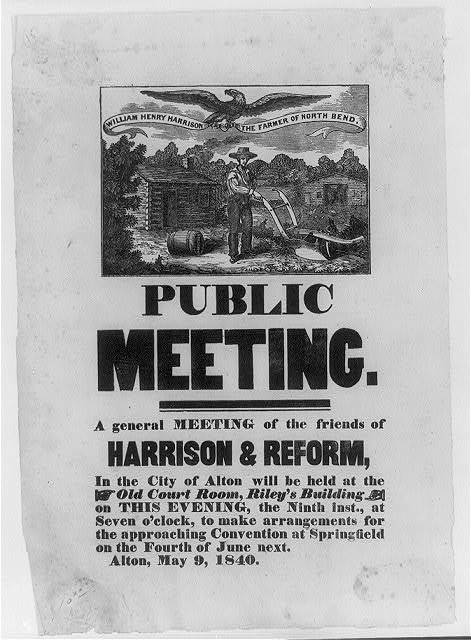 A special meeting of the Tippecanoe club of the City of Alton, will be held at the counting room of B. Clifford, jr. on Wednesday evening, May 27th, at half past 7 o'clock. By order of the President. J. Hall, Sec'y. Alton, May 26, . Alton Institute. A lecture will be delivered this evening, at the Baptist church, by Rev. 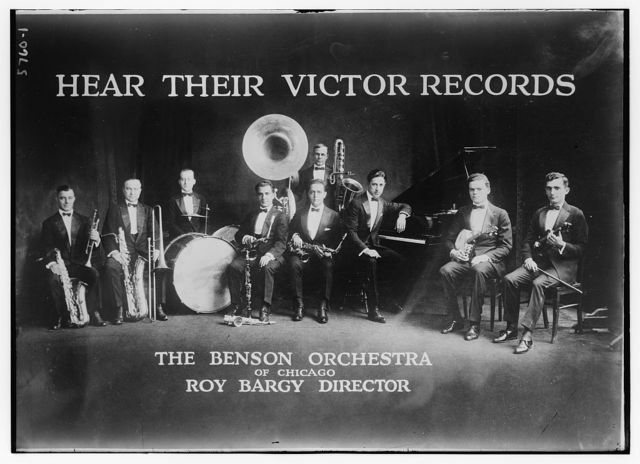 G. B. Perry. Subject- "Elevated intelligence conducive to pure morality." ... J. W. Lincoln, Sec'y. [Alton] Feb. 12 [1840?]. [Rules.] 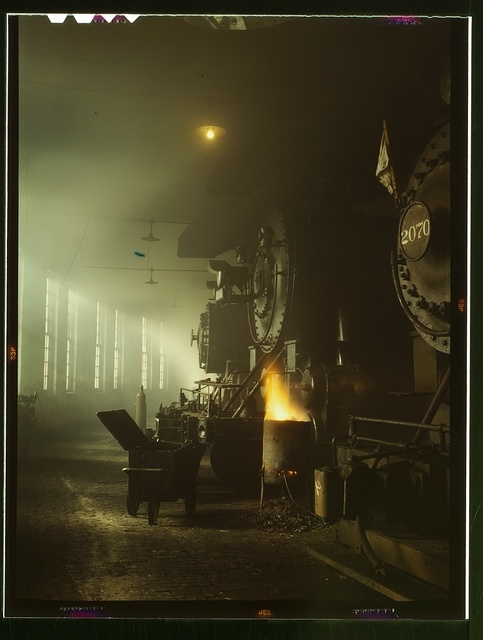 Collinsville, Illinois ----- 184-. Notice!! Gov. 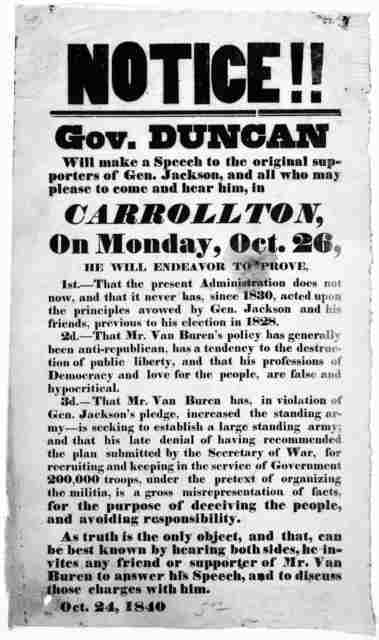 Duncan will make a speech to the original supporters of Gen. Jackson, and all who may please to come and hear him in Carrollton, on Monday, Oct. 26 ... Oct. 24, 1840. [Carrollton? Ill.]. 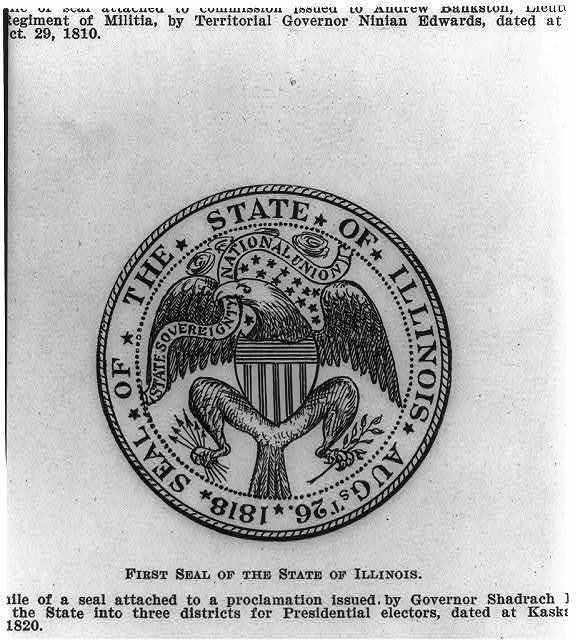 A list of the members of the 12th General Assembly of the State of Illinois, with their age, occupation, place of residence, politics &c.
Madison County Harrison convention to be held at Edwardsville, Monday, April 6 ... Alton. Printed at the "Telegraph" Office . 5 dollars reward! 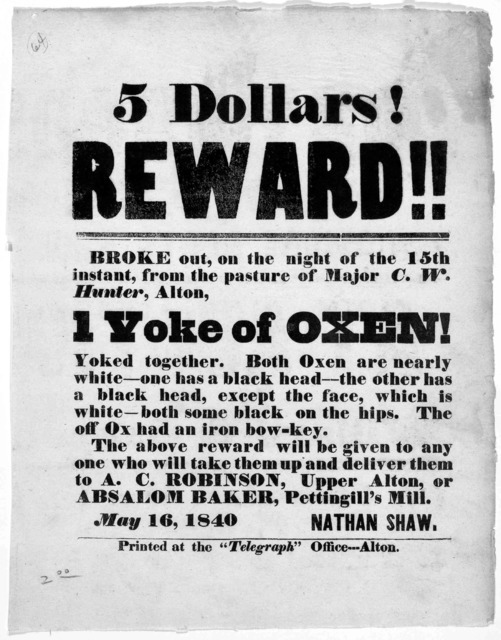 Broke out, on the night of the 15th instant, from the pasture of Major C. W. Hunter, Alton 1 yoke of oxen! ... Alton. 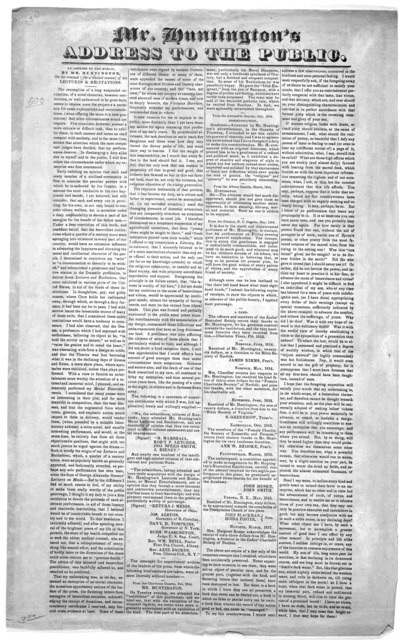 Printed at the "Telegraph" office May 16, 1840. Attention!! Whigs! Democrats! and Conservatives!!! All who want to put their horses in a good English grass pasture, can be accommodated by applying to the subscriber in Upper Alton ... L. S. Wells. 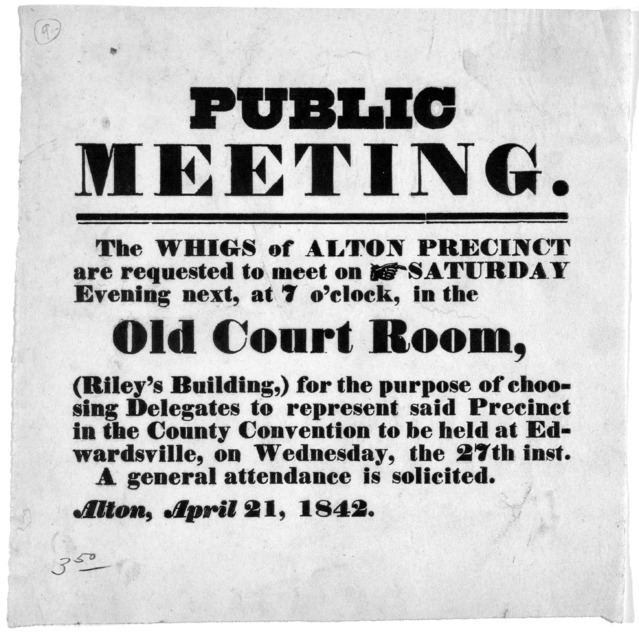 [Upper Alton, Ill] [1840?]. 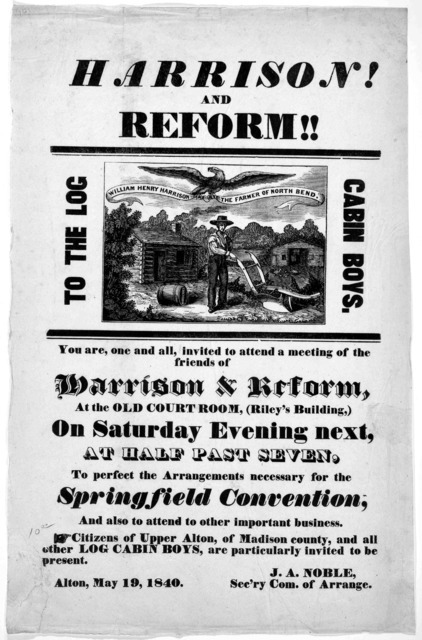 Minutes of the regular Baptist association; held at Apple Creek church Morgan County, Illinois. October 2d, 3d, & 4th, A. D. 1840. Alton "Telegraph" . Public meeting. 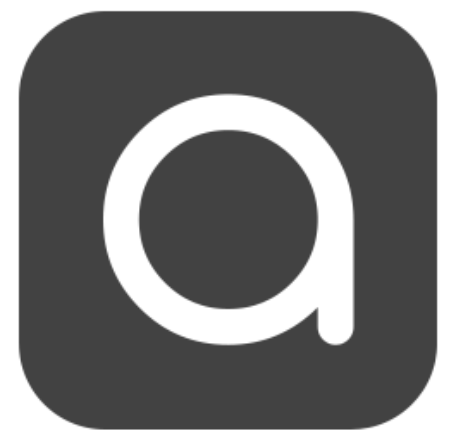 G. B. Arnold, an independent democratic candidate for the state Senate, from this County, will address the Citizens of [blank] at [blank] o'clock. 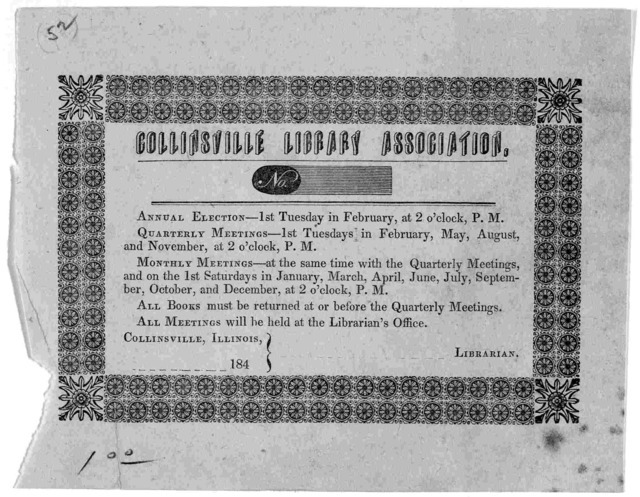 A general attendance is requested [Ill., 1840?]. Map of the projected railway from Harrisburg to Pittsburg [sic], with proposed extension to Cleveland, Wooster, Sandusky, Toledo, Cincinnati; Michigan City, Chicago, Galena, Rock Island, St. Louis, &a; in connection with the public works of Pennsylvania, Ohio, Indiana and Illinois. 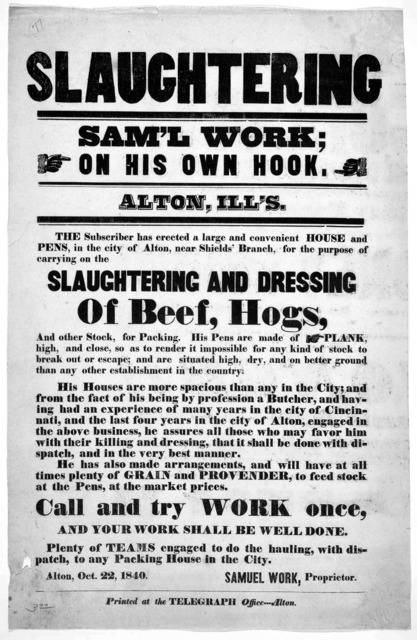 Slaughtering of beef and pork at Alton, Illinois ... Thornton & Kirby. Alton. 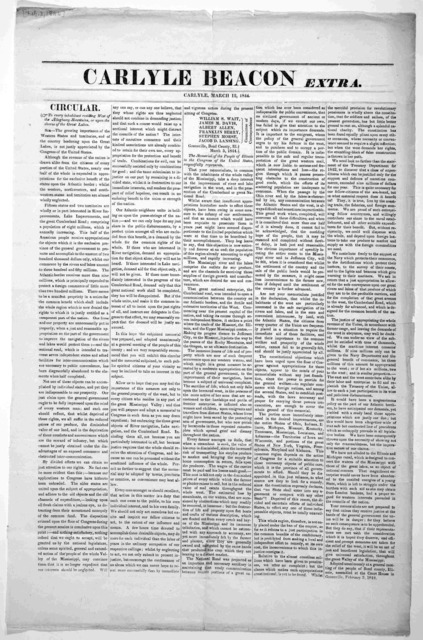 Nov. 17, 1841. Alton. Printed at the "Telegraph" office . $25 reward!! Stolen from the shop of the subscriber, in Alton, on Thursday, the 8thinstant, some 80 or 100 finger rings! ... John Hatch. Alton, Sept. 11, 1841. Alton institute. The regular annual meeting of the members of the institute, will be holden on Monday, June 28th, at 8 o'clock P. M. ... J. W. Lincoln, Rec. Sec. 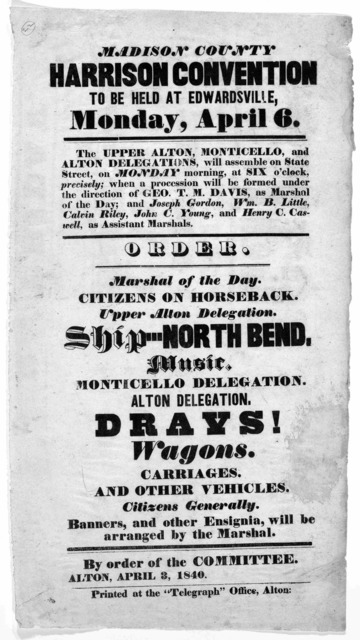 Alton, June 26, 1841. 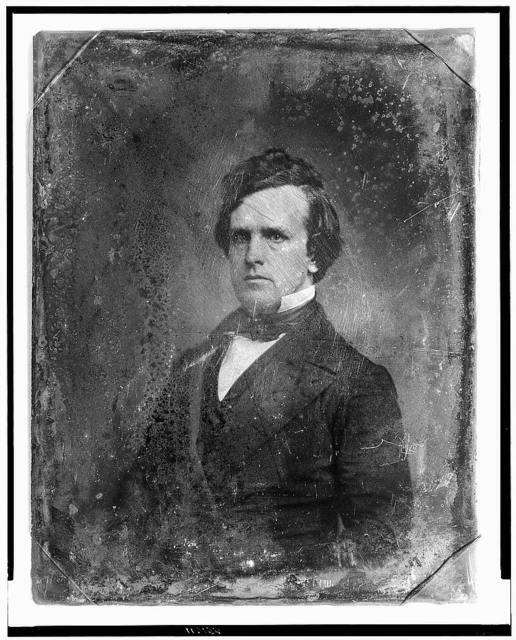 Mr. Huntington's address to the public. An address to the public by Mr. Huntington, on the renewal (for a limited season) of his lectures & recitations ... [s. l., 1841?]. 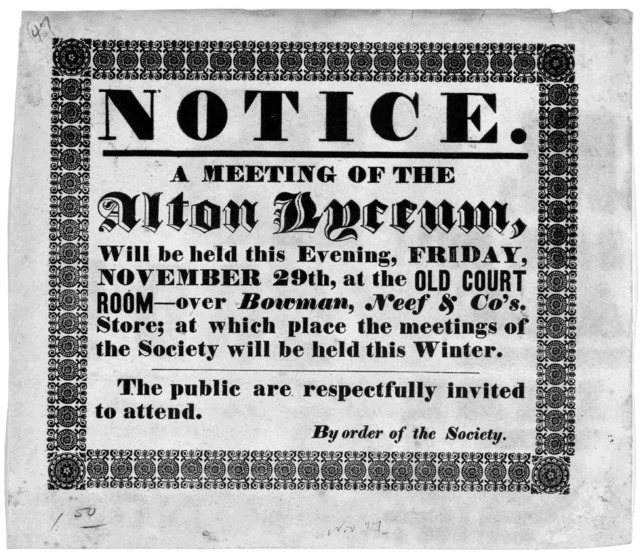 ... A regular meeting of the above society, will be held at the Old Court Room, on Tuesday evening next, October 12th, 1841, at 7 o'clock .... J. W. Calvin, Rec. Sec. Oct. 9, 1841. $100 reward. The above reward will be given for the apprehension and conviction of the rascal or rascals, who entered the office of the undersigned, on the night of Saturday, the 20th instant, and attempted to force open their iron safe. New cheap store!! Boot, shoe & slipper manufactory ... Groceries, boots & shoes ... Sam'l Lesure. 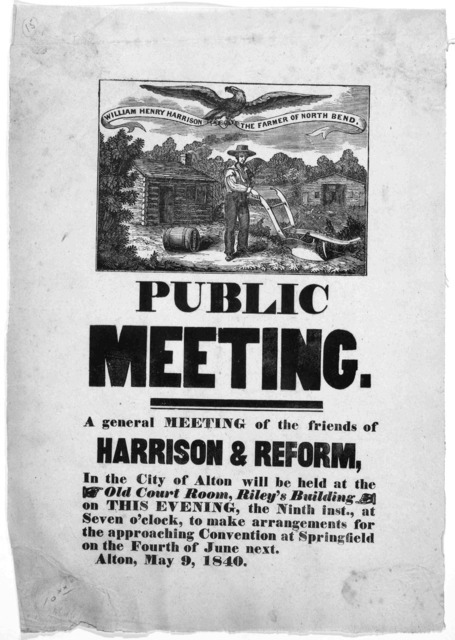 Alton, Sept. 15, 1841. Alton. Printed at the "Telegraph" office . Notice. the introductory lecture, before the Alton institute, has been postponed, on account of the inclemency of the weather, until Tuesday evening next ... J. W. Lincoln, Rec. Sec. 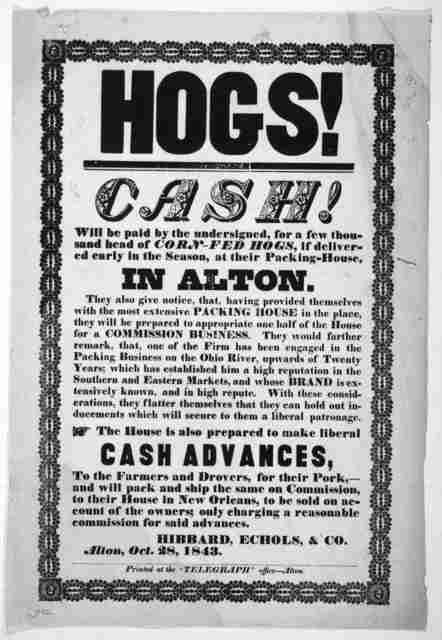 Alton, Friday, Jan. 29, 1841. 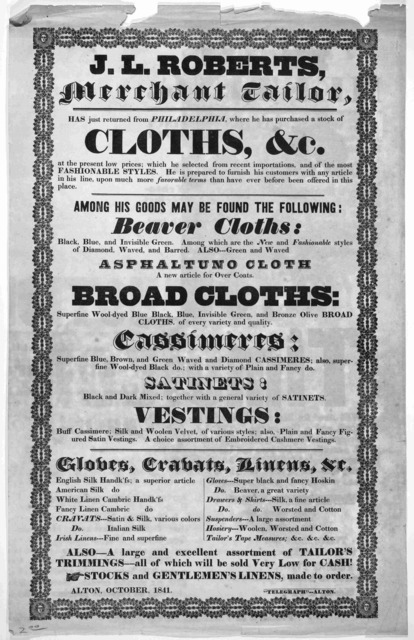 J. L. Roberts, merchant tailor, has just returned from Philadelphia, where he has purchased a stock of cloths, &c ... Alton, October 1841. "Telegraph" --- Alton. Ladies fair!! To be held in Alton, September 16, 17 & 18. The Ladies centenary fair, will open at the Old Court room, on Thursday & Friday next, at 4 o'clock P. M., and on Saturday, at 10 A. M. for the whole day! Alton, Sept. 11, 1841. 75 dollars reward! Escaped from the Alton penitentiary, on the 20th inst. 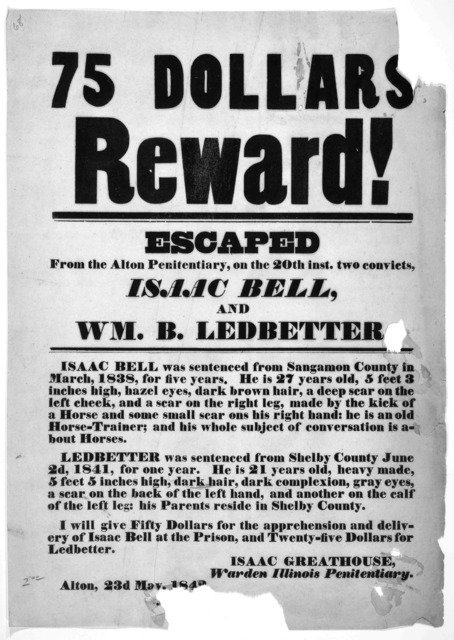 two convicts, Isaac Bell and Wm. B. Ledbetter ... Isaac Greathouse, Warden Illinois penitentiary. Alton, 23d May, 1842. Fulling, dying, and cloth dressing ... J. A. Montgomery. 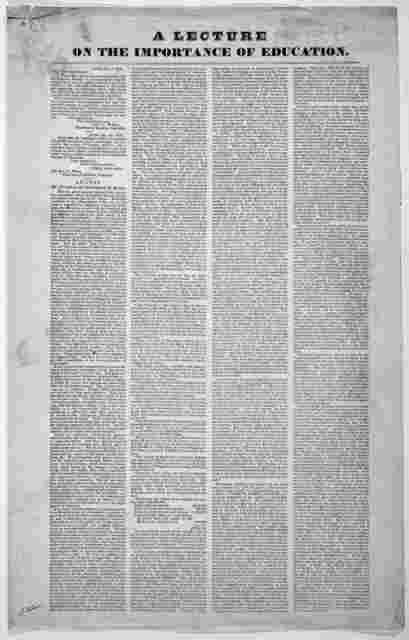 Nov. 1842. Alton. Printed at the "Telegraph" office . Public vendue. The undersigned, administratrix of the estate of Edward Fisher deceased, will sell, at public vendue, on Saturday, April 22d, the personal property of said estate ... Catherine M. Fisher, Administratrix of Edw'd Fisher, deceased. 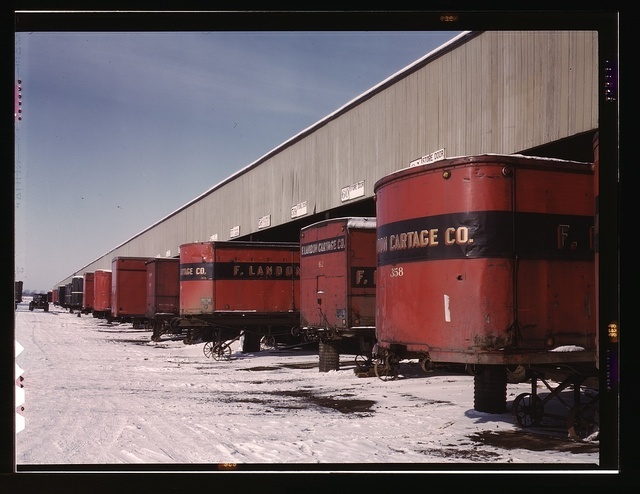 Annual report of the Illinois mutual fire insurance company. Office Ill's mutual fire insur. 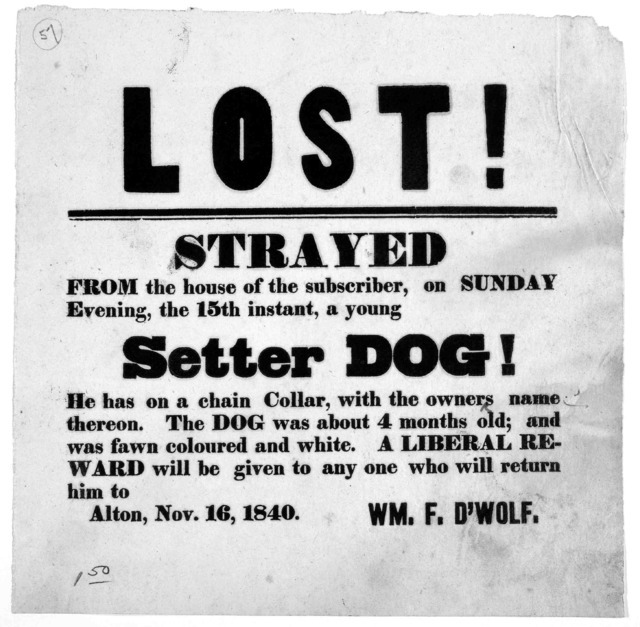 co. Alton, April 11th, 1843. Carlyle Beacon extra. 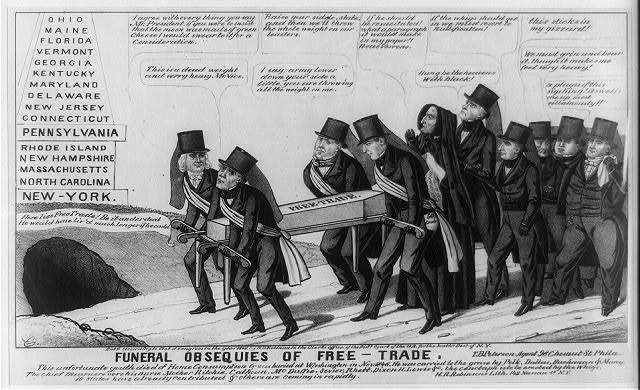 Carlyle, March 12, 1844.